The Global Volcanism Program has no activity reports for Ilopango. The Global Volcanism Program has no Weekly Reports available for Ilopango. The Global Volcanism Program has no Bulletin Reports available for Ilopango. 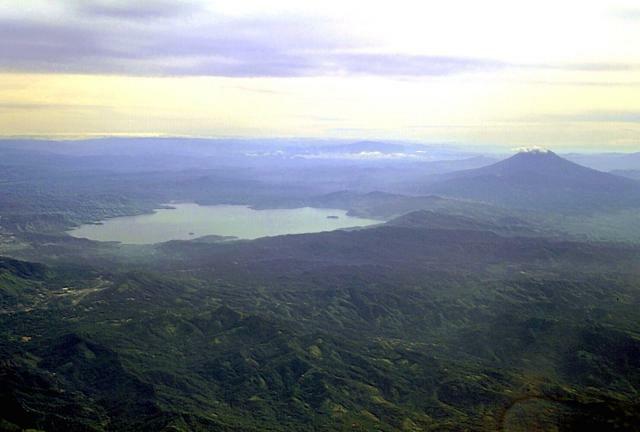 The scenic 8 x 11 km Ilopango caldera, filled by one of El Salvador's largest lakes, has a scalloped 150-500 m high rim. The caldera, which lies immediately east of the capital city of San Salvador, is strongly controlled by regional faults of the central Salvador graben. Four major dacitic-rhyolitic explosive eruptions during the late Pleistocene and Holocene produced extensive pyroclastic-flow and pyroclastic-fall deposits that blanket much of El Salvador. The latest collapse resulted from the massive 5th century CE Terra Blanca Joven (TBJ) eruption, which produced widespread pyroclastic flows and devastated early Mayan cities. Post-caldera eruptions formed a series of glassy dacitic and andesitic lava domes within the lake and near its shore. The Islas Quemadas, a group of low islets in the center of the lake that mark the summit of a largely submerged lava dome, were formed in 1879-80 during the only historical eruption of Ilopango. Dull R, 2004. Lessons from the mud, lessons from the Maya: paleoecological records of the Tierra Blanca Joven eruption. In: Rose W I, Bommer J J, Lopez D L, Carr M J, Major J J (eds), Natural Hazards in El Salvador, Geol Soc Amer Spec Pap, 375: 237-244. Dull R A, Southon J R, Sheets P, 2001. Volcanism, ecology and culture: a reassessment of the Volcan Ilopango TBJ eruption in the southern Maya realm. Latin Amer Antiquity, 12: 25-44. Golombek M P, Carr M J, 1978. Tidal triggering of seismic and volcanic phenomena during the 1879-1880 eruption of Islas Quemadas volcano in El Salvador, Central America. J. Volcanol. Geotherm. Res., 3: 299-308. Mann C P, Stix J, Vallance J W, Richer M, 2004. Subaqueous intracaldera volcanism, Ilopango caldera, El Salvador, Central America. In: Rose W I, Bommer J J, Lopez D L, Carr M J, Major J J (eds), Natural Hazards in El Salvador, Geol Soc Amer Spec Pap, 375: 159-174. Richer M, Mann C P, Stix J, 2004. Mafic magma injection triggering eruption at Ilopango caldera, El Salvador, Central America. In: Rose W I, Bommer J J, Lopez D L, Carr M J, Major J J (eds), Natural Hazards in El Salvador, Geol Soc Amer Spec Pap, 375: 175-189. Rolo R, Bommer J J, Houghton B F, Vallance J W, Berdousis P, Mavrommati C, Murphy W, 2004. 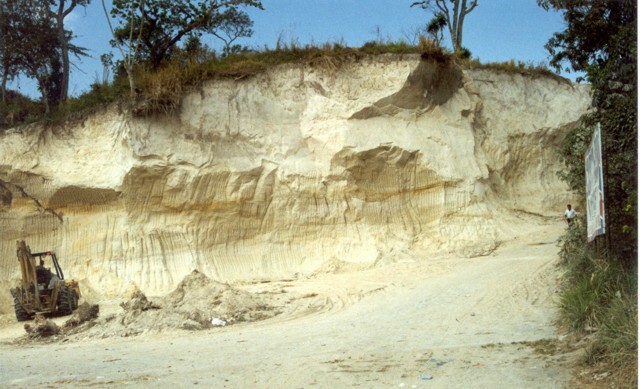 Geologic and engineering characterization of Tierra Blanca pyroclastic ash deposits. In: Rose W I, Bommer J J, Lopez D L, Carr M J, Major J J (eds), Natural Hazards in El Salvador, Geol Soc Amer Spec Pap, 375: 55-67. Sheets P D, 2004. Apocalypse then: social science approaches to volcanism, people, and cultures in the Zapotitan Valley, El Salvador. In: Rose W I, Bommer J J, Lopez D L, Carr M J, Major J J (eds), Natural Hazards in El Salvador, Geol Soc Amer Spec Pap, 375: 109-120. Williams H, Meyer-Abich H, 1955. Volcanism in the southern part of El Salvador with particular reference to the collapse basins of Lakes Coatepeque and Ilopango. Univ Calif Pub Geol Sci, 32: 1-64. There is no Deformation History data available for Ilopango. There is no Emissions History data available for Ilopango. The 8 x 11 km Ilopango caldera, filled by one of El Salvador's largest lakes, has a scalloped 150-500 m high rim. The caldera, seen here from its west rim, is strongly controlled by regional faults of the central Salvador graben. Its latest collapse resulted from the massive 5th century CE Tierra Blanca eruption that produced widespread pyroclastic flows and devastated early Mayan cities. 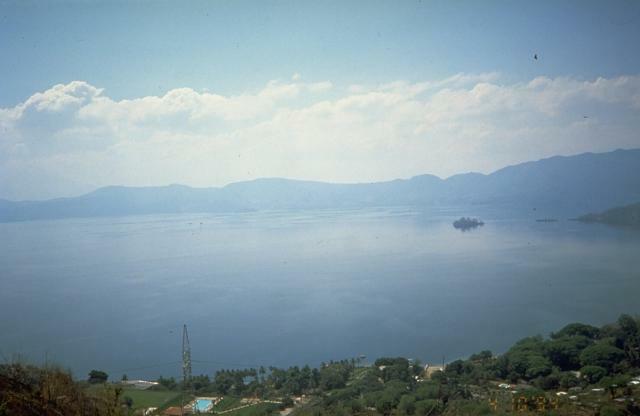 The latest of a series of post-caldera eruptions formed the Islas Quemadas, a group of low islets in the center of the lake, in 1879-1880. Photo by Kristal Dorion, 1994 (U.S. Geological Survey). 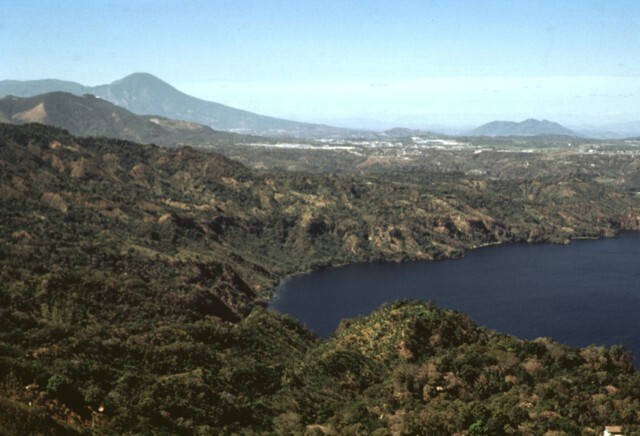 The SW wall of Ilopango caldera rises about 500 m above the surface of the caldera lake. Punta La Peninsula (center) on the western side of the caldera extends a kilometer into the lake. The high wall on the southern side of the lake is a fault scarp in southward-dipping rocks of the Pliocene Balsamo formation. The scenic lake is a popular resort destination from the capital city of San Salvador, and the shores of the lake are dotted with resorts and vacation homes. 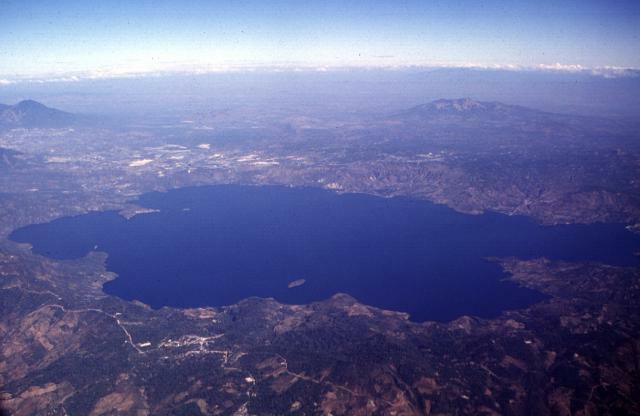 Lake Ilopango is seen in this aerial view from the SW with San Vicente stratovolcano at the right. The latest collapse of the 8 x 11 km Ilopango caldera occurred after a powerful eruption during the 5th century CE that produced widespread pyroclastic flows and devastated early Mayan cities. Dacitic lava domes form small islands near the shore of the lake and rocky islets near its center. Copyrighted photo by Stephen O'Meara. 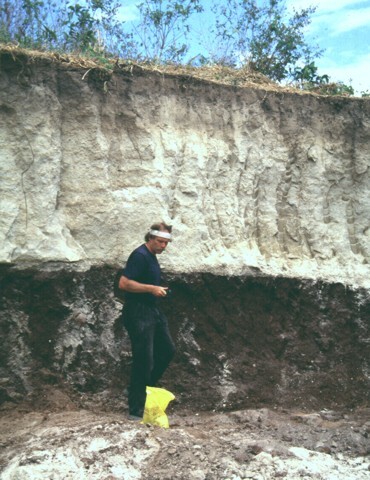 Volcanologist Jim Vallance samples the TB3 (Tierra Blanca 3) deposit, the second oldest of four major deposits associated with the formation of Ilopango caldera. This outcrop is located south of the town of Panchimalco, about 20-30 km SW of Ilopango caldera. Photo by Carlos Pullinger, 1996 (Servicio Nacional de Estudios Territoriales, El Salvador). One of the most impressive features of El Salvador is the scenic 8 x 11 km Ilopango caldera, filled by one of El Salvador's largest lakes. The caldera, which has a scalloped 150-500 m high rim, lies immediately east of the capital city of San Salvador, seen at the upper left. The latest collapse of Ilopango caldera resulted from the massive 5th-century CE eruption, which produced widespread pyroclastic flows and devastated early Mayan cities. Post-caldera eruptions formed a series of glassy dacitic lava domes within the lake and near its shore. 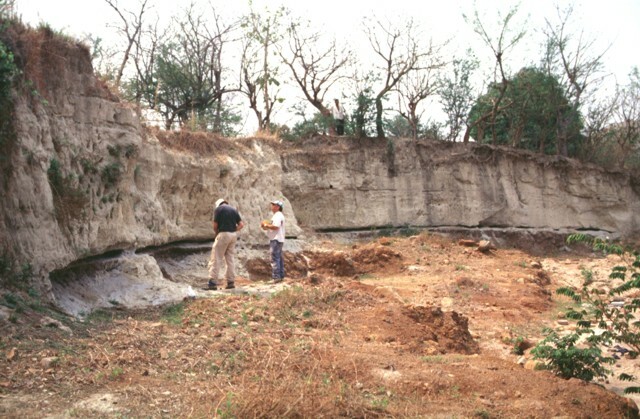 The four major pyroclastic units associated with the incremental formation of Ilopango caldera are exposed in this quarry. The Tierra Blanca ("White Soil") unit that blankets much of central and western El Salvador consists (from bottom to top) of the Pleistocene TB4 (the orange-colored unit at the base), TB3, and TB2 units (separated by thin soils), and the Holocene TBJ unit. The latter is called the Tierra Blanca Joven (the young Tierra Blanca) and was erupted about 1500 years ago. Note the geologist on the left side of the outcrop for scale. Geologists investigate an outcrop of the Tierra Blanca Joven (TBJ) formation about 10 km SE of Ilopango caldera. The TBJ was produced during the last of four major explosive eruptions that formed the caldera. Dacitic pyroclastic flows and ash and pumice fall blanketed much of central and western El Salvador. The eruption destroyed early Mayan cities and forced their abandonment for decades to centuries. Trade routes were disrupted, and the centers of Mayan civilization shifted from the highland areas of El Salvador to lowland areas to the north and in Guatemala. 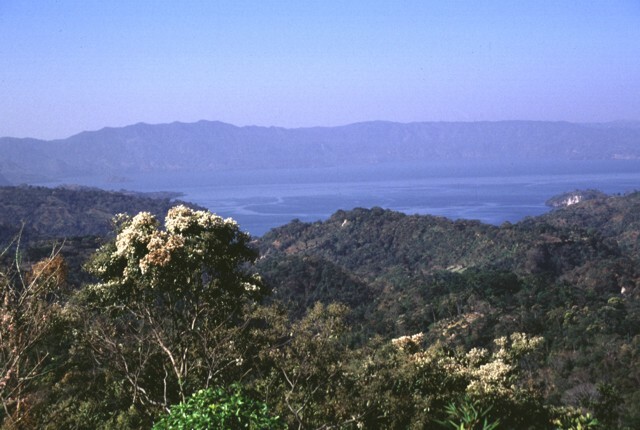 Ilopango caldera is seen here from the NE with the southern caldera wall in the background. The 8 x 11 km wide caldera was formed during four major Quaternary eruptions, the last of which occurred about 1500 years ago. The southern caldera wall rises about 500 m above the lake, which has a maximum depth of about 250 m. The small island at the left side of the lake (above the flowering shrub) is Isla Cerro los Patos, a post-caldera dacitic lava dome. 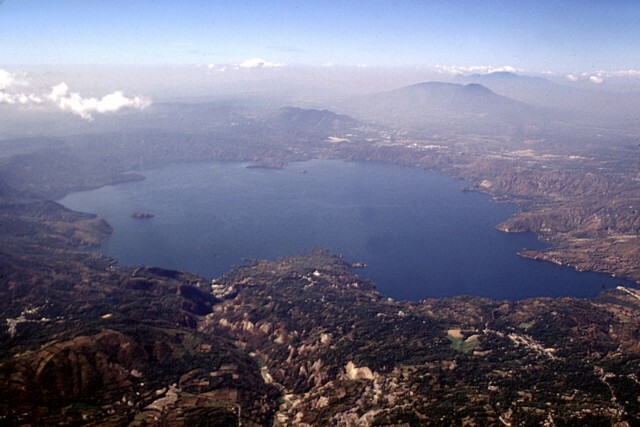 Scenic Lake Ilopango occupies a large volcanic caldera immediately east of the capital city of El Salvador in the foreground. The caldera is seen here from San Salvador volcano, overlooking the city of the same name, with San Vicente volcano in the background. The caldera was formed during four major eruptions, the last of which was about 1500 years ago. This eruption blanketed much of central and western El Salvador with ash and pumice. Photo by Paul Kimberly, 1999 (Smithsonian Institution). White-colored pyroclastic-flow and -fall deposits from Ilopango caldera known collectively as Tierra Blanca (White Soil) blanket much of central and western El Salvador. 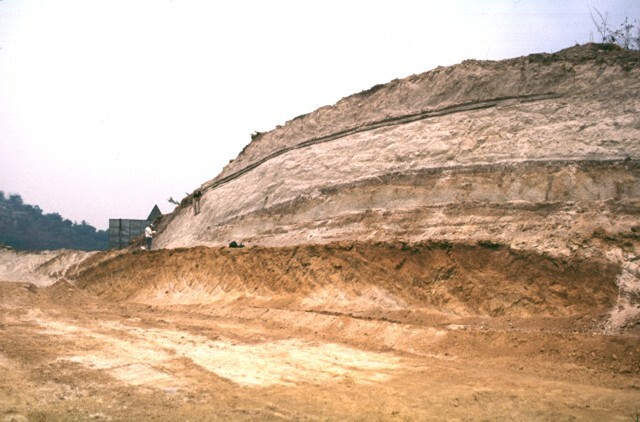 This quarry near the city of Cojutepeque, 9 km ENE of the caldera, exposes the Tierra Blanca Joven (TBJ) formation, produced during the youngest of the several Tierra Blanca eruptions about 1500 years ago. The eruption destroyed early Mayan cities and forced their abandonment for decades to centuries. 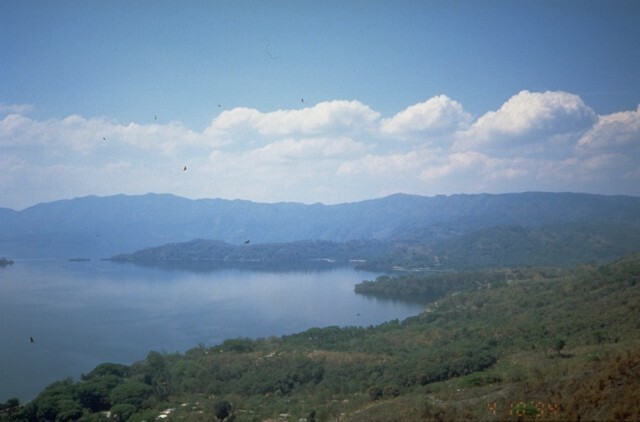 The western side of Lake Ilopango is seen from the southern rim of Ilopango caldera. The broad peak on the right-hand horizon is Guazapa, a Pleistocene volcano in the Interior Valley of El Salvador that has young pyroclastic cones at its base. 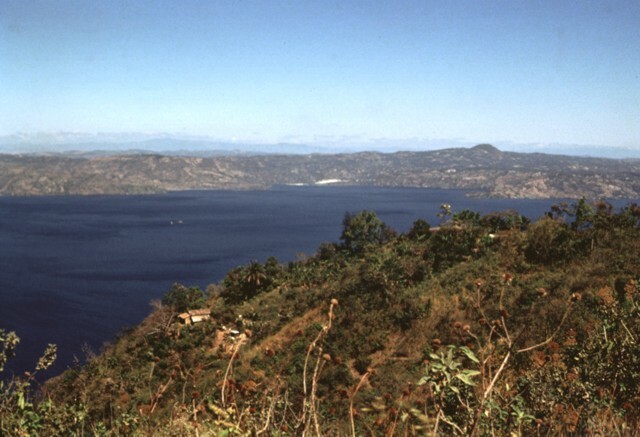 The northern wall of Ilopango caldera rises about 400-500 m above the lake. Much of the caldera rim is covered with a thick blanket of deposits from the caldera-forming eruptions, but some lava domes are exposed in the caldera wall. Photo by Bill Rose, 1978 (Michigan Technological University). 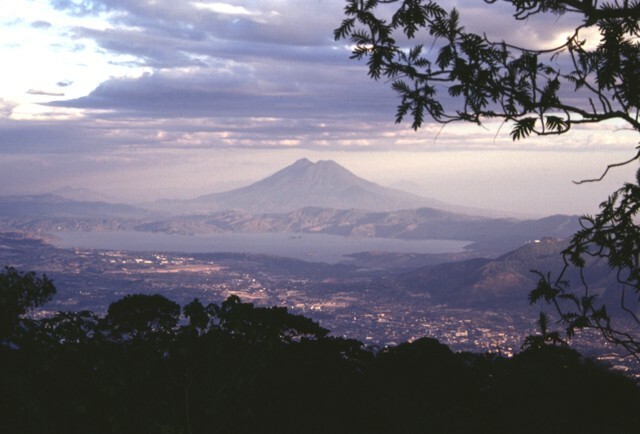 The SW corner of Ilopango caldera is visible in the foreground with the outskirts of the capital city of San Salvador in the middle distance. The high peak on the left horizon to the NW is El Picacho, part of the San Salvador volcanic complex, a historically active volcano overlooking the capital city. Below it to the left is San Jacinto, a Pliocene lava dome complex. The low peak on the upper right horizon is Cerro Nejapa, a Pliocene volcano in the Interior Valley of El Salvador. 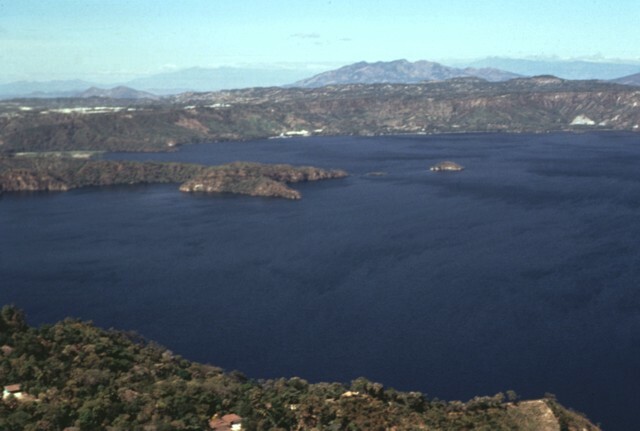 The two tiny islands in the center of Lake Ilopango barely visible above and slightly to the left of the house in the foreground are the Islas Quemadas. These are post-caldera dacitic lava domes that were emplaced December 31, 1879 to March 1880 during Ilopango's only historical eruption. A huge column of ash and incandescent rocks was erupted on January 20, and the dome breached the surface on January 23. It reached a height of 50 m above the lake surface before violent explosions March 5 destroyed most of the subaerial part of the dome. The 8 x 11 km wide Ilopango caldera fills the center of the image in this view from the ESE. Fresh, light-colored exposures of the Tierra Blanca Joven formation in the foreground associated with the latest caldera-forming episode were in part created by landsliding during the January 2001 earthquake. The capital city of San Salvador lies beyond the lake, between it and San Salvador volcano (upper right). The Santa Ana volcanic complex lies beyond San Salvador volcano on the right horizon. There are no samples for Ilopango in the Smithsonian's NMNH Department of Mineral Sciences Rock and Ore collection. Large Eruptions of Ilopango Information about large Quaternary eruptions (VEI >= 4) is cataloged in the Large Magnitude Explosive Volcanic Eruptions (LaMEVE) database of the Volcano Global Risk Identification and Analysis Project (VOGRIPA).